"My book is history, biography, and a tribute to my mother. It is also a manual of quality family living, a story of courage, loyalty, the work ethic, and a record of the times. I wrote Maude for me and you, but especially for my grandchildren and great-grandchildren and all the youngsters across this land who some day will marvel at how their ancestors did so much with so little." or the first time in its 59-year-history, the Ohioana Library Association presented a very special Ohioana award posthumously. 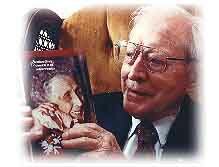 Mardo Williams of Columbus, who died February 3, 2001 at age 95, was honored for his work as a journalist and as the author of the critically acclaimed biography MAUDE (1883-1993): She Grew Up With the Country and his children's book GREAT-GRANDPA FUSSY AND THE LITTLE PUCKERDOODLES. The award was presented to his daughters at the Ohioana Day Awards Ceremony held October 20, 2001, at the Fawcett Center on The Ohio State University campus. ver the years, the Ohioana Library Association has presented more than 700 awards to some of the most talented artists, writers, and musicians associated with the state of Ohio, including James Thurber, Kay Boyle, Ian Frazier, Toni Morrison, and Elizabeth George. "Mardo Williams' body of work is a unique and outstanding cultural contribution," said Linda Hengst, Director of the Ohioana Library Association. ardo Williams was born in 1905 in an historic Ohio farmhouse on the banks of Rush Creek. He began his career in 1927 (at the age of 21) [see "My Accidental Career"], becoming the only reporter at the Kenton, Ohio daily, the News-Republican. In 1945, he was recruited to the copy desk of the Columbus Dispatch, eventually writing a daily business column with byline. After he retired in 1970, he wrote for trade periodicals and did PR work. is two daughters wanted to keep him busy after his wife of 65 years died. They urged him to write down some of the family stories they'd heard as children. The book, published in June 1996, started as 50 pages. His oldest daughter read it aloud to her writers' group in New York City. They loved it and said they wanted more. Over the course of two years, with the writers' group as audience and editors, it grew to 335 pages and sent the author on a new career. By the time Mardo was 95, he had done more than 40 bookstore signings, multiple radio and TV interviews, and hundreds of talks before community organizations and senior-citizen groups. t the time of his death, he left behind the just-completed manuscript of his novel, ONE LAST DANCE. Blindness, caused by macular degeneration, did not deter him from his work. He simply dictated the last few chapters of his novel. He then began work on his next book, which was to be a memoir that would reflect all the changes he had seen in the newspaper business over his 44-year career. here's no such thing as being too old," Mardo said. "Life is for living, no matter what our age or condition. If we can sing, we should sing. If we can write, we should write. We should always be in search of a new experience, always be ready to commit ourselves to a new interest." It seems fitting that a man who lived up to this philosophy to his very last day was the first posthumous recipient of an Ohioana Library Association special award for his unique and outstanding life-long literary contributions. In Great-Grandpa's eyes, the Little Puckerdoodles are unpredictable imps whose ingenious questions demand answers only he can provide. Morgan, age 89, collides with Dixie, ten years younger, at the entrance to Whispering Pines Retirement Center. What happens next changes both their lives and their expectations about growing old. The two battle illness, scandal and a nearly fatal accident. They discover it's never too late to fall in love. Click here, to contact publisher for Reading Group discounts. Click here to read MY ACCIDENTAL CAREER, Mardo's lively account of his 44-year newspaper career.